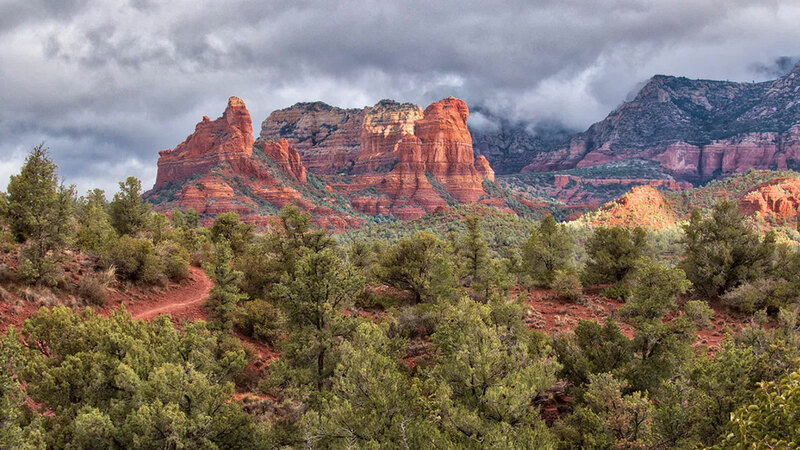 Living in Sedona, I have been privy to lots of beautiful changing scenery due to changing light conditions. The most interesting images happen on the edges of light when sunrise or sunset occurs. Or, when you find the edges of light where light spills through a window or under an overhang. Storms arriving or clearing are often wonderful ways to capture a different look. Today’s article is from just such a scene. The original complete scene that grabbed my attention. An overview is always a great idea. Light as this is often fleeting in a landscape. I always keep a “car-camera” available for moments such as these. It’s a Panasonic Lumix FZ2500 — an all-in-one that can go from 25mm wide to 480mm zoom. It has lots of features including the ability to capture up to seven stops of exposure on a single button push (and can bracket focus too, but that’s another post). Photographing a scene can be composed in many different ways. And, each individual way tells a slightly different story of the scene. I’ve found over the years that whatever grabs my interest in a passing landscape is just a starting point and any car stop should include exploring the area just a bit more. Sunlight was sneaking through the clouds and painting lovely patches and patterns as a storm was clearing. As I drove I kept seeing wonderful situations appear but couldn’t get to the right place to stop before the light changed. I did finally happen upon the scene from this article, with highlights on the red rocks and a place to pull off the road. I jumped out and began working the scene as quickly as possible. Getting a bit tighter on the scene as I worked it. The first image was an overview of the vista before me. Then quickly I started looking for variations, many accomplished by using the zoom on the camera and even change in position of a few steps can make quite a difference. I believe it was Robert Capa who said, “If your pictures aren’t good enough, you aren’t close enough.” A zoom lens can help you with getting close enough to make a better image. Closing in on the story even more with selective square crop. Because of the bright sun caressing the shadowed landscape I knew the density range of a single capture wouldn’t be enough. I set the camera for a five-stop bracket. Back in the studio I processed the images in what I feel is one of the best HDR software programs out there because of the natural rendition of the final images, Aurora HDR 2018. To my eye this is the most realistic blending of all the HDR programs short of processing ‘by-hand’ using Luminosity Masks. Trying out a vertical crop works for the scene. My favorite of the series getting even tighter into the image with a square crop highlighting a diagonal S Curve created with the path and light. Keep a camera handy and watch for the edges.